At Tampopo, we strive to provide our customers with authentic Japanese culinary delights using as much as possible local materials and ingredients to prepare the dishes we serve. We will also use selective ingredients to come up with a wide range of menu items and some creative dishes derived from the Japanese food tradition. Needless to say, we will keep improving the menu to provide healthier choices as we do by using healthier ingredients. On example is our incorporation of blue agave as a sweetener. 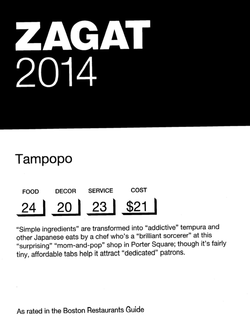 We have received latest 2014 Zagat rating which shows Tampopo achieving 24 points for Food which is in the category of "Very Good to Excellent". Enjoy our food by the "brilliant sorcerer" with "simple ingredients", excellent execution.